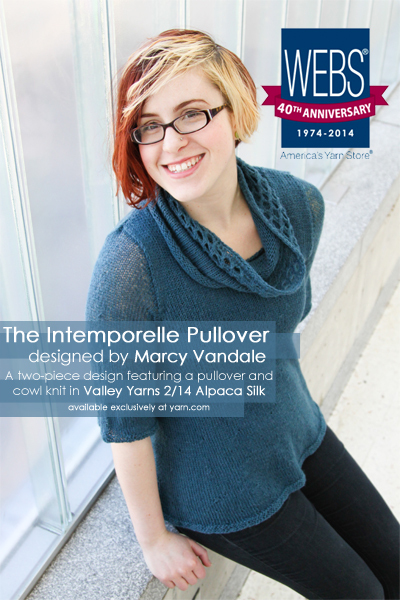 Another friend of WEBS, Marcy Vandale, has taken our 2/14 Alpaca Silk and transformed it into a wardrobe staple with timeless style and class, the Intemporelle Pullover. This long, flowing pullover knit in one piece from the bottom up features an accompanying cowl. The body, as well as the cowl, is knit with the yarn held double while the sleeves use a single strand, making a piece that transcends the seasons. 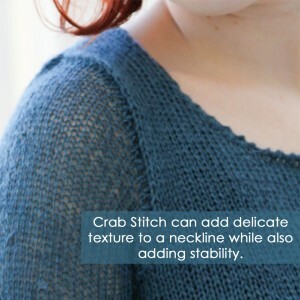 The neckline is adorned with a decorative crab stitch border and the cowl adds just enough extra warmth for those cool mornings or evenings. I live only an hours drive from WEBS, just far enough not to be a problem (winkwink). A customer of WEBS for the past decade, I was fortunate enough to develop a friendship with Kathy on a more personal level, bonding as moms sharing similar experiences. Our kids are roughly the same ages and equally as active. Social networkers can find us trading updates from rinks and courts, fields and courses. When Kathy asked me to design for the 40th Celebration, I was thrilled. I have dabbled in designing over the last few years while raising my 4 kids. My designs reflect my “always on the go” lifestyle in both style and knitting ease and somewhat selfishly, what I need for my wardrobe. I get dressed for the day early in the morning when the kids get ready for school. This time of year, temperatures are unpredictable but I am on the go all day and into the evening. I designed a classic sweater that could be layered as needed and will get you from volunteering at school to the grocery store and to an evening meeting after driving the practice carpools. The fabric is lightweight and comfortable and the accessory cowl allows the sweater to be a timeless wardrobe staple over several seasons. I designed this sweater to also be knit on the fly, waiting for appointments and at fields and during games. I love wearing what other moms have seen me knitting during the season. I learned to knit in my dorm my freshman year in college, not exactly the “show and tell” my parents hoped for after that first semester. I knit occasionally over the following years but became a Knitter with a capital K over the last decade as I took classes, grew a stash, began teaching knitting and eventually designing. My designs are purposefully simple but functional to fit the lifestyles of active women and knitters. This entry was posted on Monday, May 12th, 2014 at 11:00 am	and is filed under 40th Anniversary. You can follow any responses to this entry through the RSS 2.0 feed. You can skip to the end and leave a response. Pinging is currently not allowed. I love this! I have a question about the sizing. How much ease should it have?